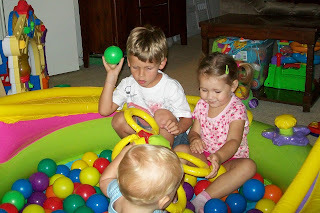 We pulled our ball pit out of storage and invited some friends over to play in it with us. 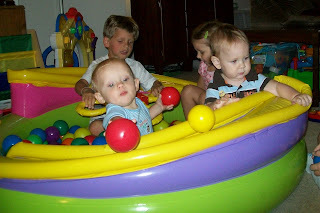 Dawson really enjoyed it when he was little and Brady loves balls so we thought he would like it as well. 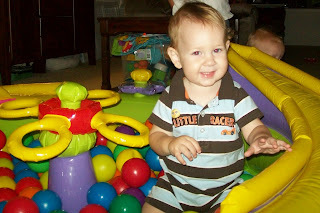 He has had fun climbing in and out and rolling the balls down the slide, but I think he needs to be a little older to really appreciate how fun it can be. Dawson and Hannah playing with the hoops. Brady and Wesley rolling balls down the slide. 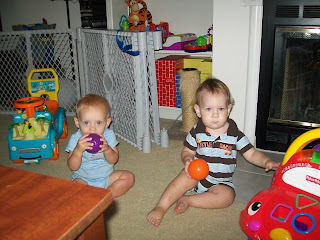 Brady and Wesley hanging out and playing with a few of the balls.